Proper Hunt: Where Are You Spring? You were just here a few weeks ago, allowing us to actually wear shoes sans socks, and to go out without the need for a heavy coat. But now, you are nowhere in sight and all I can do is look at my new spring wardrobe and let out a big sigh. Yes, I was easily swayed a few months ago and purchased items that I clearly cannot wear until April or May. Happens every year. 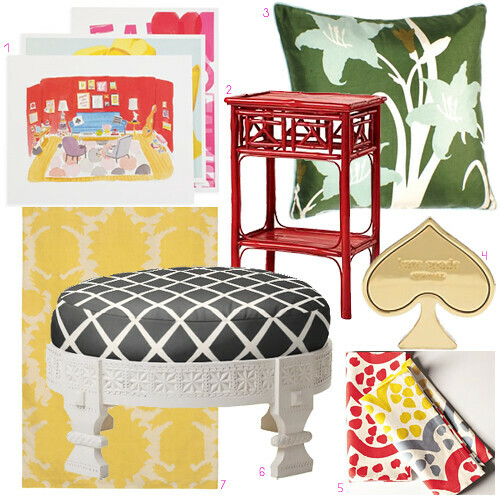 For those of you in the same boat as me, the only thing that is keeping my Spring-deprived self going strong are the fun, colorful items I see in retail stores for the home. There's something about Spring that just makes you want to surround yourself with fresh colors. Especially after hibernating from the cold winter we've had, can you blame anyone for wanting to surround themselves in color? My husband and I are definitely going to try to lighten up our house by switching out some of our "wintery" items with some lighter pieces for the warmer months. For example, remember those beautiful burnt orange/red velvet drapes we got back in November? Well, as gorgeous as they are, ideally we'd like to get something a little more playful for the spring & summer. I'll be sure to keep you guys posted on what changes we make in the house. Do you guys plan on making any changes in your home for Spring? ha! I'm asking the same question. I'm hoping with a little redecorating I can lure spring. but we'll see!